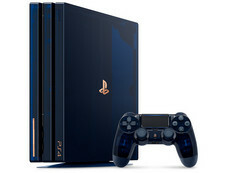 Sony managed to sell more than 500 million PlayStation consoles since the launch of the PSOne in 1994, and, to celebrate this monumental achievement, it is launching a special Limited Edition PS4 Pro that comes with a dark blue translucent casing, a 2 TB HDD, a PS Camera, and a translucent controller. The console itself has bronze-gold insignia and a special plaque that lets the owner know which of the 50,000 units is in his possession. First launched in late 1994, the PlayStation console quickly became the fastest selling gaming device of all times, and, up until now, Sony managed to sell half a billion consoles worldwide. More precisely, the combined number of PSOne, PS2, PS3, PS4, PSP and PS Vita consoles sold to date is sitting at an impressive 525.3 million, while PS4 (all variants) alone sold 81.2 million as of July 22, 2018. To celebrate this monumental achievement, Sony announced the 500 million Limited Edition PS4 Pro that comes with a few interesting features. The Limited Edition comes with a dark blue translucent case, and the controller gets the translucent treatment as well. It also features a 2 TB HDD and a PS Camera, plus all the insignia has a metallic bronze-gold color, including the special plaque that shows the models are part of a limited 50,000 units series. According to the official Sony page, the Limited Edition will be available starting August 24 and will cost US$500. Sony will announce the participating retailers soon, but, since this edition is limited to 50,000 units, those who want to buy this model will have to be very quick about their orders.